One of the keys to successful long term investing is learning how to balance your risk appetite with your investment time horizon. 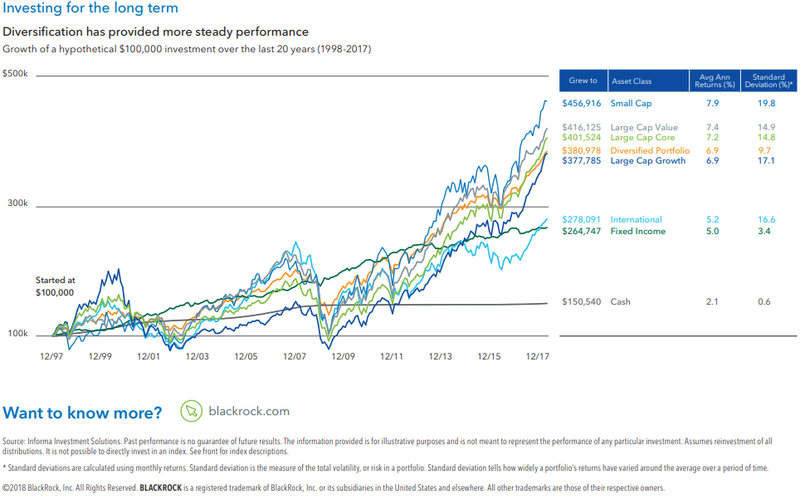 Through a diversified investment approach, one can mitigate risk and volatility, potentially reducing the number and severity of drawdowns within a portfolio. Diversification of an investment portfolio is a strategy of spreading your investment dollars around so that your exposure to any one stock, sector, or asset class is limited. Because these assets have varying degrees of both positive and negative correlation, an investor benefits by lowering portfolio volatility, increasing risk-adjusted returns, and reducing reliance on any particular security or asset class. For example, historically in periods of negative equity performance, fixed income positions have performed positively. A similar relationship can be found across different geographical regions and sectors. The below charts depict asset class returns over a 20 year period from 1998-2017. The orange box represents a diversified investment portfolio consisting of 35% bonds, 10% international equity, 10% small cap equity, 22.5% Large Cap Growth, and 22.5% Large Cap Value. 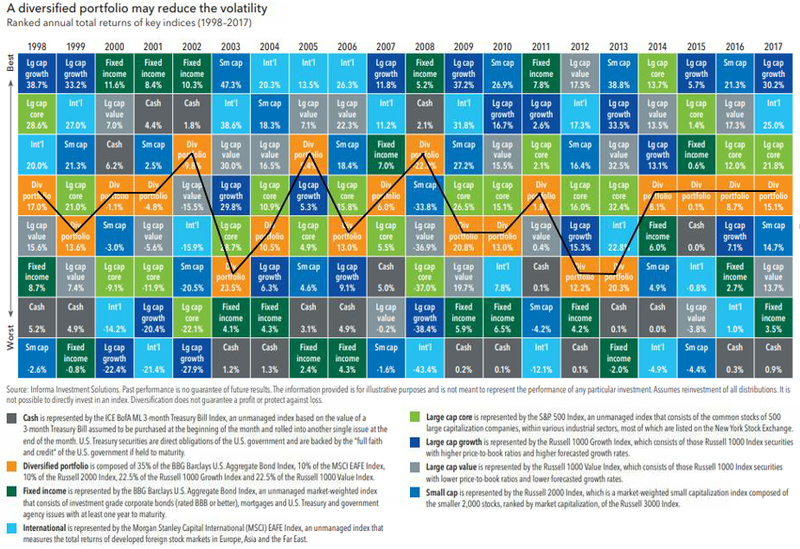 By reducing losses during the largest market drawdowns of 2001, 2002, and 2008, the diversified portfolio was able to match the returns (6.9% annualized) of Large Cap Growth stocks with just over half of the volatility as measured by Standard Deviation (9.7% compared to 17.1%). It is important to remember that not all investments within a diversified portfolio will work at the same time. However, by spreading out the risk exposures and reducing the variability of portfolio returns over a given year, investors are less likely to make decisions based on short term market fluctuations which may be harmful to satisfying long term objectives. Investors should assess and consider their investment goals annually and discuss any changes with us. Any new information may warrant a re-allocation of your portfolio. The Information contained in this document is based on data received from third parties which we believe to be reliable and accurate. YorkBridge Wealth Partners, LLC has not independently verified the information and does not otherwise give any warranty as to the truth, accuracy, or completeness of such third party data, and it should not be relied upon as such. Any opinions expressed herein are our current opinions only. YorkBridge Wealth Partners, LLC is an SEC Registered Investment Adviser under the Investment Advisers Act of 1940 (“Advisers Act”). Registration of an investment advisor does not imply any specific level of skill or training. The information contained in this document is to assist with general planning. Please consult with your own tax advisor and attorney for more specific information. The information provided herein does not constitute investment advice and is not a solicitation to buy or sell securities. Please note that nothing in this content should be construed as an offer to sell or the solicitation of an offer to purchase an interest in any security or separate account. Consult with an accountant or attorney regarding individual accounting, tax or legal advice. No advice may be rendered, unless a client service agreement is in place.